kingsnake.com photo gallery > Aquaria Displays & Setups > This is my new tank!! Description: This is my new fish tank..7 gallons..!! Great looking tank very healthy looking fish. 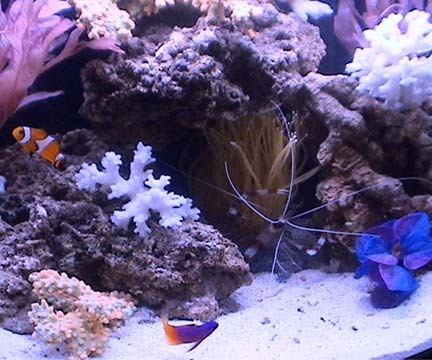 I notice you have a fire goby and my favorite a bi color blenny(I think thats what it is by the picture). How do they get a long together? My bicolor blenny is a grumpy fellow but great personality. i have a 75 gallon bow front and a albino Polypterus senegalus,synadontis ocellifer,3 albino rainbow sharks,1 congo tetra ,7 boesami rainbows and a pygmey albino bushy nose pleco. They arent in this particular picture but if you click to see all his pics of this tank you see other fish he has in it also. Thats 7 gallon? Wow can you post a picture of the whole thing? Great setup how long did it take for you to get to this point?